Adam Walton visits the Welsh factory producing the revolutionary Raspberry Pi computer. The Raspberry Pi is a credit card-sized bare-bones computer created by a group of volunteers from academia and the technology industry. It was launched last year to get children interested again in programming and it’s already created a quiet revolution by switching on a whole new generation onto coding. This week’s Science Café comes from the Sony Technology Centre at Pencoed near Bridgend where the Raspberry Pi is manufactured. Adam’s guide is Gareth Jones, Project Leader for Raspberry Pi production at Sony. He also meets the Centre’s General Manager Gerald Kelly to find out how the RPi came to be made in Wales and he puts in a call to Dr. Eben Upton who designed the machine and set up the Raspberry Pi Foundation. 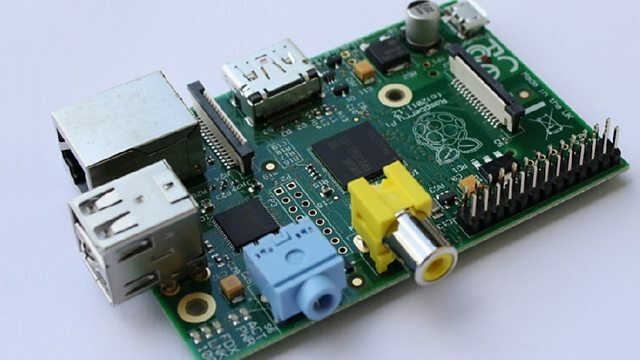 Adam is also joined by Dr. Tom Crick of Cardiff Metropolitan University to discuss the RPi’s role in computer science education in schools and we hear from a Raspberry Jam – a get-together of RPi enthusiasts – in Machynlleth.